Physical characteristics: Crimson chats average about 4.7 inches (12 centimeters) in length, and 0.4 ounces (11 grams) in weight. Males have dark brown backs, with a white throat and white center belly, and white undertail coverts, small feathers that cover the base of longer tail and wing feathers. Their eyes are a creamy white, and they display a vivid crimson, red, crown and undersides. Females have light brown upperparts and head, with a white throat and belly, and pale red and buff patches on the breast, flanks, and rump. Juveniles look like females except that they do not have any red on their breast. Geographic range: Crimson chats can be found throughout the inland, western, and southern coasts of Australia, and occasionally in southeastern and eastern Australia. Habitat: Crimson chats tend to prefer to live in arid and semiarid shrubland. They sometimes can be found in grassland or farmland. Diet: Crimson chats are omnivores, eat animals and plants, primarily eating insects and other invertebrates, animals without backbones, off the ground and from low shrubs, and sometimes from the air. They also eat seeds and probe flowers for nectar. 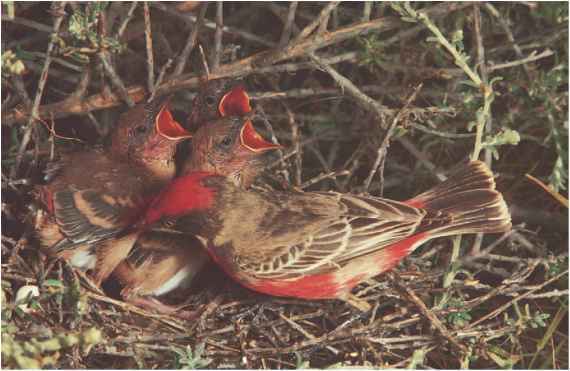 Behavior and reproduction: Crimson chats tend to be nomadic in nonbreeding season. They call with a metallic, harsh deep tone, whistling and twittering call. Because they usually come out and breed after rains, their breeding range can differ greatly from one year to the next. Crimson chats form seasonal breeding pairs. Their cup-like nests can be found in low shrubs no higher than 3 feet (0.9 meters). They have clutches with two to five eggs. 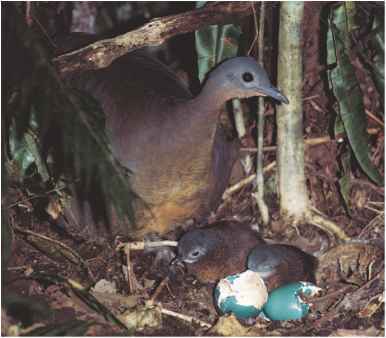 Both male and female incubate the eggs for ten to fourteen days, with fledges at ten days. Both parents also protect and feed the young, and show distraction displays that draw predators away from the young. Crimson chats and people: Desert visitors enjoy observing the colorful bird. Blakers, M., S. J. J. F. Davies, and P. N. Reilly. The Atlas of Australian Birds. Carlton, Australia: Melbourne University Press, 1984. Campbell, Bruce, and Elizabeth Lack, eds. A Dictionary of Birds. Vermillion, SD: Buteo Books, 1985. Simpson, Ken, and Nicolas Day. The Birds of Australia. Dover, NH: Tanager Books, 1984. "Australian Chat, Epthianuridae." Bird Families of the World. http:// montereybay.com/creagrus/Australian_chats.html (accessed on June 18, 2004). "Australian Chats." World Bird Guide. http://www.mangoverde.com/ birdsound (accessed on June 18, 2004). "Bird Checklist of the World—Australia (continental including Tasmania)." Avibase—The World Bird Database. http://www.bsc-eoc.org/avibase/ avibase.jsp?region=auct&pg=checklist&list=clements (accessed on June 18, 2004).